Disclaimer: I'm on the product advisory comity of Neuralitic. My increased role as web analytics industry specialist put me in contact with lots of companies involved in all kinds of analytics, far and abroad. Two weeks ago I talked about Coradiant's focus on performance analytics, earlier this week I presented Percute Technologies and now I would like to introduce Neuralitic, a Montreal startup doing really serious stuff with mobile analytics. In Web Analytics, cookies are our friends. In mobile analytics, cookies pale in comparison to what is possible. 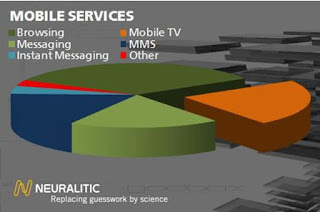 Cell phone carriers knows a heck of a lot about you: phone number is pretty much unique to you, triangulation can pinpoint where you are, they know about your cell phone plan and your credit score, they know all about your demographics, and exactly when/who you called and which applications you used. However, the technology is evolving fast toward G3, especially with the hype around the widespread availability of advanced cell phones such as the Black Berry and the Apple iPhone (coming to Canada on July 11th!). The actual constraints of speed and technology are fading away. But is that all there is? Why would we limit our analytics only to cell phones accessing our web sites? What about mobile ads, gaming, videos and applications running on mobiles? Neuralitic is a probe that listen to the traffic between your cell phone and the provider. As such, it is not targeted directly at website owners, but at carriers and content providers that have a close partnership with the carriers. Basically, Neuralitic can provide information about any wireless IP-based trafic: weather/traffic/mapping services, games, SMS, email, browsing, etc... It can gather up to two 2 years worth of data that can be merged with other sources of data owned by the carrier. Of course, this is highly valuable data for carriers themselves, allowing them to narrow-customize their offering. Carriers are not making much money on voice anymore. The future is the data, not the voice; good mobile analytics becomes even more critical. Carriers could also elect to offer the data as an added service to their business clients: providing demographics, advertising profiles and much more. I'm no mobile expert. But I remember last year's Web Analytics 2.0 definition from Avinash Kaushik and the "multiplicity" concept. I also remember the resulting race for the next buzzword: Web Analytics 3.0 from Peterson and his focus on mobile analytics. I also commented on my own: do we really care if it's 2.0 or 3.0? From a "business analytics" perspective, mobile analytics and the new data it offers, as amazing as it can be, is just another source of information to take better business decisions. Easier said than done, I agree, since most companies are already struggling with web analytics. But what Neuralitic is doing, and the way they are doing it, is simply amazing and will not only make it a lot easier, I think it has the potential of significantly changing the online marketing landscape. Firefox 3 is out, get it now!